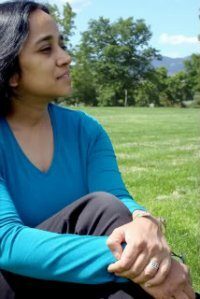 Last year I mentioned that most of the stories I was seeing were of short-story length, with few long novelettes or no­vellas. Although perhaps most of this year’s stories were still of short-story length, this year saw a dramatic resur­gence of novellas. By one count, there were over 80 novellas published in the SF/fantasy/horror genres in 2017. 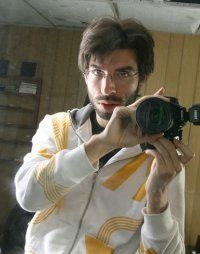 Most of these were published as standalone chapbooks, and the ambitious new pro­gram from Tor.com Publishing can ac­count for a lot of these. There were also many released by a wide array of small presses, as Kickstarter projects, and in electronic formats. 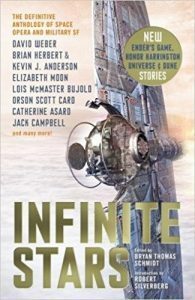 Industry stalwarts such as Asimov’s, Analog, and F&SF continued to publish novellas as well, as they’ve always done, and even Clarkesworld, which had formerly had strict word-limits, seems to be loosening up and increasing the length of stories that they’re willing to accept. The odd result of this is that you have a lot of novellas on one end of the scale and a lot of short-stories on the opposite end, with fewer novelettes in between. Perhaps, like the mid-list in book publishing, novelettes are becom­ing marginalized. There were a lot of original antholo­gies published in 2017. The SF antholo­gies divided up into two rough groups, the space opera/military SF antholo­gies (with the balance between the two forms varying from book to book), and the futurology anthologies, many of them with corporate or government sponsors, leading Jonathan Strahan to dub them “Think-Tank Fiction.” The strongest original SF anthology of the year was Strahan’s Infinity Wars, os­tensibly a collection of military SF, although in some ways it’s actually a kind of stealth anti-war anthology, with character after character wrestling with doubts about the mo­rality of the war and the orders they’ve been given. 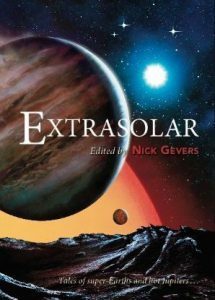 The best stories here are Indrapramit Das’s “The Moon Is Not a Battle­field” and Nancy Kress’s “Dear Sarah”, although there are also strong sto­ries by Eleanor Arnason, Peter Watts, Rich Lar­son, Carrie Vaughn, An Owomoyola, Elizabeth Bear, David E. Levine, E.J. Swift, and others. Of the near-future fu­turology/Think Tank anthologies, the strongest was Visions, Ventures, Escape Velocities, ed­ited by Ed Finn & Joey Eschrich, a mixed fiction/non-fiction anthology about space futures from Arizona State University, sponsored by NASA, which featured strong stories by Carter Scholz, Madeline Ashby, Eileen Gunn, Vandana Singh, Ramez Naam, and Steven Barnes. 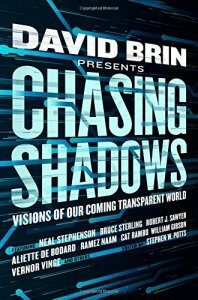 Also strong is another mixed fiction/non-fiction anthology, Chasing Shadows: Visions of Our Coming Transparent World, edited by David Brin & Stephen W. Potts. 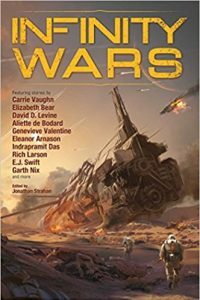 Best of the original stories here are “Elephant on Table” by Bruce Sterling, “First Presentation” by Aliette de Bodard, and “Eminence” by Karl Schroeder, but the anthology also features good work by Nancy Fulda, Jack Skilling­stead, Gregory Benford, Cat Rambo, and Brenda Cooper. Good reprints in Chasing Shadows include work by Damon Knight, Robert Silverberg, Kathleen Ann Goonan, Vernor Vinge, William Gibson, Neal Stephenson, Brin himself, and others. Another fairly strong futurology anthol­ogy is Sunvault: Stories of Solarpunk and Eco-Speculation, edited by Phoebe Wagner & Brontë Christopher Wieland. Sunvault features strong stories by Lavie Tidhar, A.C. Wise, Nisi Shawl, Jess Barber, and Tyler Young, as well as reprints by Daniel José Older and Nick Wood. Many of the year’s other Think Tank anthologies don’t have physical copies available, but are available online, includ­ing A Flight to the Future, edited by Kathryn Cramer, sponsored by an X Prize and by the Japanese airline company Ana; Wired: The Fiction Issue: Tales from an Uncertain Future edited by Scott Dadich, Stories in the Stratosphere, from Arizo­na State University, edited by Michael G. Bennett, Joey Eschrich & Ed Finn, and Megatech, spon­sored by The Economist magazine, edited by Dan­iel Franklin. A subset of futurology anthologies is dystopian anthologies, and there were two this year; Global Dystopias, a special section of the Boston Review, edited by Junot Díaz, featuring strong if rather grim and brutal work by Charlie Jane Anders, Tananerive Due, and Maureen F. McHugh, and Welcome to Dystopia, edited by Gordon Van Gelder, a very near fu­ture anthology (with some stories set next year and few more than ten years on, concentrating mostly on negative results of President Trump’s policies), featuring good work by Geoff Ryman, Janis Ian, Ruth Nest­vold, Marguerite Reed, Elizabeth Bourne, Paul Witcover, and others. A bit harder to categorize: Children of a Dif­ferent Sky, edited by Alma Alexander, is a mixed SF and fantasy anthology about refugees and im­migrants, with part of the profits donated to vari­ous charitable institutions that help refugees; good work here by Aliette de Bodard, Jacey Bedford, Brenda Cooper, Seanan McGuire, and others. Where the Stars Rise: Asian Science Fiction and Fantasy, edited by Lucas K. Law & Derwin Mak, is a mixed SF/fantasy anthology featuring good stuff by S.B. Divya, Priya Sridhar, Tony Pi, Jeremy Szal, Amanda Sun, and others. Shad­ows & Reflections: Stories from the Worlds of Roger Zelazny, edited by Trent Zelazny & War­ren Lapine, is a tribute anthology that offers other writers the chance to play with Zelazny’s worlds and characters; good stuff here by Steven Brust, Gerald Hansman, Lawrence Watt-Evans, Shariane Lewitt, and others. There were only a few original fantasy antholo­gies this year. One of the most acclaimed was The Djinn Falls in Love and Other Stories, edited by Mahvesh Murad & Jared Shurin, which featured strong work by Helene Wecker, K.J. Parker, E.J. Swift, Nnedi Okorafor, Catherine King, JY Yang, Maria Dahvana Head­ley, and others. Noted without com­ment is The Book of Swords, edited by Gardner Dozois. Although there are streaks of darkness in it, the subject matter of Mad Hatters and March Hares, edited by Ellen Datlow, tends to make the stories more whimsi­cal than horrific, so I’m going to list it here in fantasy rather than horror; there are good stories here by Andy Duncan, Ysabeau S. Wilce, Richard Bowes, Seanan McGuire, Jane Yolen, Jeffrey Ford, Delia Sherman, and others. I don’t pay close attention to the horror field, considering it out of my purview, but the origi­nal horror anthologies that got the most atten­tion seemed to be Black Feathers and Haunted Nights, both edited by Ellen Datlow. Turning to magazines, Clarkesworld had anoth­er strong year, publishing first-rate work by Kelly Robson, Naomi Kritzer, Rich Larson, Jack Skill­ingstead & Burt Coutier, Jessica Barber & Sara Saab, Vina Jie-Min Prasad, Finbar O’Reilly, and others. 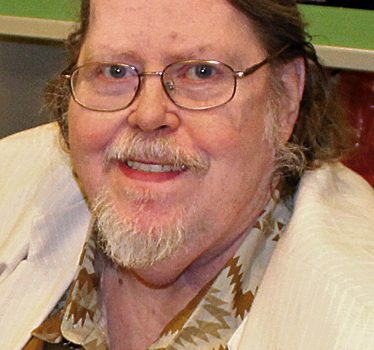 Asimov’s had another good year, publish­ing good work by Rich Larson, Ray Nayler, Harry Turtledove, Suzanne Palmer, Ian McHugh, Alex Jennings, R. Garcia y Robertson, Michael Swan­wick, Kristine Kathryn Rusch, Carrie Vaughn, Tom Purdom, Damien Broderick, and others. 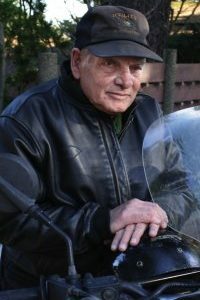 Analog had an unusually strong year, publishing good stuff by Michael F. Flynn, Alec Nevala-Lee, Bill Johnson, Maggie Clark, Rich Larson, Joe Pit­kin, James Van Pelt, and others. F&SF published good work by R.S. Benedict, Michael Swanwick, Samuel R. Delany, Matthew Hughes, Rachel Pol­lack, Kelly Jennings, Larry Niven, Robert Reed, Naomi Kritzer, and others. Lightspeed had a some­what weak year, but published good work by Indrapramit Das, Mari Ness, Cadwell Turnbull, Pat Murphy, Susan Palwick, Lina Rather, Greg Kurzawa, and others. Inter­zone also had a weakish year, but there was good stuff by Sean McMullen, Mal­colm Devlin, Erica L. Satifka, T.R. Nap­per, Laura Mauron, and others. As always, Tor.com published a mix of SF, fantasy, dark fantasy, soft horror, and more unclas­sifiable stuff this year, with good work by Greg Egan, Linda Nagata, Stephen Baxter, Allen M. Steele, Jo Walton, Julianna Bag­gott, Lavie Tidhar, Yoon Ha Lee, and others. Beneath Ceaseless Skies published good stuff by Richard Parks, Stephen Case, Carrie Vaughn, Sarah Saab, Tony Pi, M. Bennar­do, Marissa Lingen, Rose Lemberg, Kameron Hurley, Jeremy Sim, and others. There wasn’t a lot of SF to be found in Strange Hori­zons this year, which seems to have swerved back to mostly slipstream, but they did publish interesting work by Ana Hurtado, Helena Bell, Iona Sharma, Su-Yee, and others. Newish maga­zine Uncanny had entertain­ing stories by Naomi Kritzer, Sarah Pinsker, Sam J. Miller & Lara Eleana Donnelly, Seanan McGuire, Vina Jie-Min Prasad, Sarah Monette, N.K. Jemisin, Fran Wilde, Tina Connolly, and others.